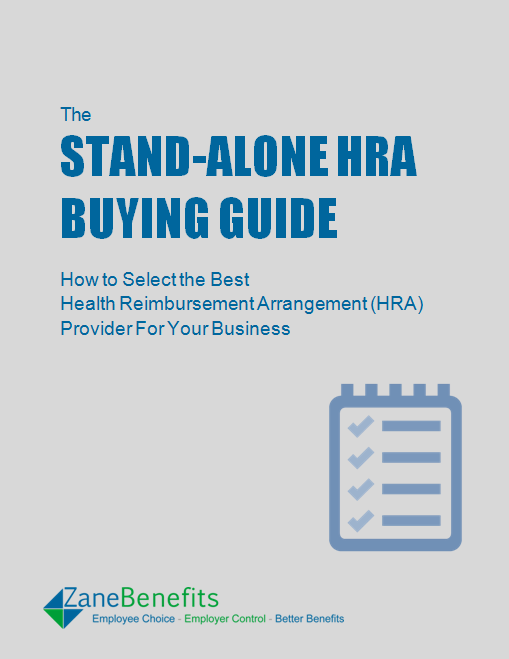 Zane Benefits, the online alternative to group health insurance, announced today the publication of a free eBook "The Stand-Alone HRA Buying Guide." The new buying guide outlines how businesses can evaluate Health Reimbursement Arrangement (HRA) providers. Stand-Alone HRA plans are a new alternative to employer-sponsored group health insurance plans. Rather than paying the costs to provide a specific group health plan benefit, employers can fix their costs on a monthly basis by establishing a Stand-Alone HRA plan. The business gives each employee a fixed dollar amount (an HRA allowance) that the employees choose how to spend. Employees use their HRA allowance to reimburse themselves for their individual health insurance costs or other medical expenses such as doctor visits and prescription drugs. The business fixes all costs and has complete control of the HRA plan. Small and medium-sized business owners, non-profits, CEOs, CFOs, HR professionals and accountants should download this buying guide to learn how to evaluate Stand-Alone HRA providers.